The Birdsfield Brick and Tile Works (also known later as Birdsfield Tile Works and later again as Birdsfield Wagon Works), were once located where the former Alex Inglis Factory is, beside the EK Expressway. 1858 – 1861 – Birdsfield -Valuation Roll J. Craig Prop. [Proprietor] & Occupier Meiklham’s Map. A good Farm Steading. There is a Brick & Tile Works on the opposite side of the T. P. [Turnpike] Road. Below – 1859 – Birdsfield Brick and Tile Works, Blantyre. 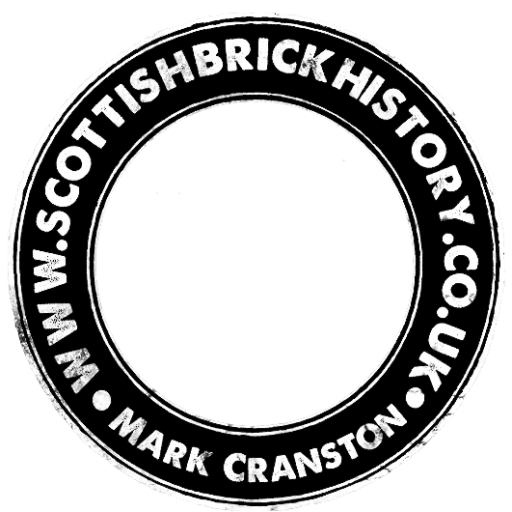 Below – 07/07/1860 – Scottish Banner – Scotch Bankrupts – William Wilson, Brick and tile maker, Stonefield. 03/08/1860 – The Glasgow Herald – Sheriff Court Hamilton. Bankruptcy examination. Sequestration of William Wilson, Brick and Tile Maker, Birdsfield, Blantyre. In January 1860, Mr John Craig of Udston (one of the trustees of James Craig) came looking for another bond to be signed, which William initially did not sign, on account of being ill. Eventually, after another calling he signed another bond. William then repeatedly asked for Mr Craig’s trustees to pay the sums promised, in order he could continue working, but the money was not forthcoming. Already from this story, we can see the circumstances of ill health, perhaps affecting the tile works output, change of contracts types and the period of confusion arising after James Craigs death was leading to a downfall of this business. Its clear also from the reports that the relationship between William Wilson and the trustees of James was not a good one. In May 1860, the trustees called for William Watson and offered to take his house and businesses from him for the sum of £460 which was to include interest , the bond monies and was to be payable to the trustees. William refused on the basis that he considered his brand new house alone to be worth at least £500, never mind the bonds or business. However pressed, and under stress, William relented in May 1860 and the property became owned by the trustees of James Craig. This opened the flood gates to Watsons other creditors, seeking their expenses and bills, before all money was gone. The amount of assets declared remaining was in the region of £59, of which £13 or so belonged to Watsons partner, William Stewart, that partnership only lasting 3 months. It was discovered that all assets had previously been given to William Stewart, most likely to stop the trustees from claiming anything else. 1882 – W & J Cochran, Brick and Tile Manufacturers, Birdsfield, Blantyre. 1886 – W & J Cochran, Brick and Tile Manufacturers, Birdsfield, Blantyre. 18/02/1897 – Glasgow Herald – Brick and Tile Work to let. Birdsfield Brick & Tile Works situated near to High Blantyre on the Hamilton Road, presently occupied by Messrs Cochrane. There is a railway siding into the works. The plant and machinery may be acquired from the present tenants at a valuation if desired. Offers will be received up to 1st March next. Craig and Wilson – It is unknown when the kilns were first constructed at Birdsfield, but it is known that they existed in the 1840’s. A Mr. William Wilson came to Blantyre in 1846 and was initially employed and living at Birdsfield Tile Works on behalf of proprietor Mr Craig. Mr. Wilson was a labourer engaged in draining the field. In 1855, he had worked his way to become the tile maker and moved to the site as Mr. Craig’s manager. When Mr Wilson entered into these contracts, he initially had no capital and James Craig paid him every fortnight. Mr. Craig would reconcile the wages every year and it was noted that in 1858, he still owned Mr. Wilson a sum of £40. The area in the early 19th Century is shown on maps as being swampy, a good indicator that the ground was laden in clay. The 1859 map shows the brickworks clearly and it is known from the 1859 Valuation rolls that it was owned by James Craig of nearby Birdsfield, who also at that time owned Stonefield Brickworks. Mr. Wilson was still the manager for Mr Craig at Birdsfield in 1859. The roll describes, “A field of clay suitable for making building bricks & drain Tiles. There is a drying shed, Kiln & dwelling house in the Works” (likely the house of Mr. Wilson.). Mr Craig was also the farmer at Birdsfield Farm, however died shortly after in June 1859. Mr. Wilson continued to work the business and took a new contract from Archibald Craig, James’s successor in February 1860. This was on the idea of Archibald Craig, who saw Wilson creating his own opportunity and wished to return the brickworks back to being a profiting business for the Craig family. The new contract was one which let Wilson get paid on every 1000 tiles he put out, rather than a rental sum. Wilson went into partnership with William Stewart that February and together they ran Birdsfield Tile Works, as contractors. William Wilson kept the cash book, accounts and sales books. It was said in 1860 that Birdsfield wasn’t paying its way for William Watson and that by then he was concentrating on the more successful venture at Stonefield brickworks. From March until September he and Mr. Stewart made a profit of around £80. Bricks and tiles would have been in great demand at this time, providing vital local building materials for Blantyre’s population which was beginning to grow fast. However, things were about to go wrong for William Watson. By August 1860, he found himself bankrupt. J.R Cochrane – By 1878, Naismith’s directory of that year confirms Mr. J.R Cochrane of Calderglen was the owner of Birdsfield Brick & Tile Works, taking over from J. Craig. J.R Cochrane had arrived in Blantyre between 1872 and 1876 and was 49 years old at the time of taking over ownership of Birdsfield Brickworks in 1876. During Cochranes ownership before 1897, a railway line was built adjacent to the brickworks. It is known in 1882 Cochrane’s business was called “W&J Cochrane, Brick Tile Manufacturers”, indicating a partnership with a family member. In 1897, Cochrane put the Tile Works up for lease. By 1898, the quarried field from where the clay was coming from, had a large hole, which due to the nearby stream, had filled with water. Following Cochrane’s death, the buildings became derelict and were unused, the 1936 map confirming they had been all demolished by that time, the map showing nothing but an empty, marshy field. The next owners were the early branch of founders Alexander Inglis. Formed in 1935, it is stated that Messrs Alexander Inglis took over the business “The Birdsfield Wagon Works”. They were located on High Blantyre Road, directly opposite the Blantyre Industrial Estate (built 1946), on the former brickworks site. They built a small factory which is still standing today. 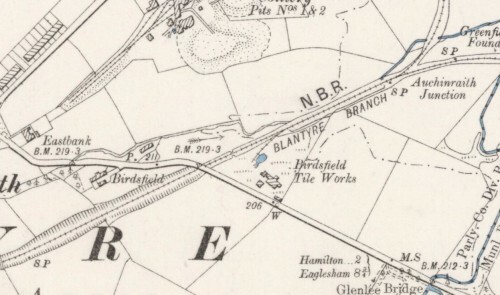 When the adjacent passenger railway line to Glasgow from Hamilton, and Burnbank via Bothwell closed in September 1952, it was announced that a branch of that line would continue to be used solely to serve Birdsfield Wagon Works, which it did until 15th May 1968. The company has continued to evolve over the years to become Scotland’s leading municipal and specialist vehicle equipment repair centre,Heavy Haulage, Car Transporters and all types of Specialised Vehicles covering suspension, chassis, bodywork and hydraulics. However, the Blantyre factory did recently close down in 2014, with operations moving to Bellshill. As of now, the site is currently unused, the buildings empty. It is located at the side of the sliproad at Auchinraith Roundabout. Robert McAlpine – history of brickmaking.